This could NOT be anymore beautiful or anymore REAL. About as true as it gets!!! Who do you trust, when you shouldn’t trust anyone? Better yet, who do trust when you can’t trust yourself? When the foundation of your world is shaken – you lose your job, your identity, or the love of your life – it changes a person. Essentially, you feel alone. Suddenly, you don’t know what’s right, anymore. Up looks like down, and down is sideways. It is a dangerous thing, when you cannot trust yourself, because you are hurting, and betrayed, and feeling off-kilter. In Thursday’s Scandal (Boom Goes the Dynamite), everyone is unsure of who to trust, and because of that, possibly trusting the wrong people. Trust is a fragile thing. It is something that people must earn, must continue to earn – and, once lost, it’s not a thing easily gained back. We surround ourselves with people that we trust, trusting them to various degrees. And yet, what happens when one person breaks that trust? Then, another. And then, finally another. It’s not one, singular pain. It’s total devastation. In relationships, we take people for who they are, see them as they are, and gauge our levels of trust accordingly. This is the danger, I suppose, to putting someone up on a pedestal. Eventually, inevitably, that person is made to fall. That is a hard thing to recover from. As you no doubt have surmised by now, I am a big fan of ABC’s show Scandal. Scandal does a pretty solid job of infusing real life scenarios into it’s fantasy situations. The latest episode showcases what it means to be a part of a team & to support your team members as best you can even in time of crisis. I call this having a great ENSEMBLE cast. OPA aka Olivia Pope & Associates, bands together in order to protect & assist the very woman who created them as an entity. It’s something that everyone WILL benefit from at least ONCE in their professional career & possibly even on a personal level as well. I believe there are 4 keys to assembling a great ensemble cast when you are hiring or adding to your team that one needs to take into consideration. Carefully taken into consideration, this team will grow your organisation & help it to stand in times of change, adversity, or even in times of struggle. Roles: What sort of impact do you want these people to have? Identify their strengths/specialities & see how it can directly impact your org. Are they someone you can place your trust in to handle any sort of situation that may arise in the event you are unavailable to do so? Would you hire a math major to handle your corporate communications? Maybe you need a new VP with a different sort of energy in order to consistently motivate & re-focus your time? Maybe it’s a person who is performing one role now, but their really great at other things your org may need to grow? Group dynamics/Group energy levels: Is there a possibility of any sort of personality clash between the people you are talking about bringing on board? Maybe the energy & effort level of one person does not align with the rest of the team. If that’s the case, is it something that can be addressed & adjusted, or is it a deal breaker & you need to sever ties? I suggest having a meeting of the minds with the people you are considering hiring to get a sense of any potential issues that may arise or how they connect & communicate with each other. Crisis/Situational Management: This is a bit ambiguous because it’s more difficult to adequately predict which situations may arise you may have to defend, defer, or deflect against. How will these people you are considering adding possibly react to a stressful situation? Is your corporate strategy in alignment with your goals & how such crises are to be handled? Identify BEFORE a situation such as this arises so that you are all on the same page as a team. Discuss scenarios that may come up & talk to them about how you would prefer it handled, also taking into account that they may have valid suggestions about how best to handle these types of situations. Talk about dealing with the media & establish & affirm on a consistent basis exactly how you want the person who is assigned to handle such matters is to address/handle them. Also ensure that there is a backup individual who as a clear understanding of what needs to be done as well…This is just like the monthly fire or air raid drills many of us have participated in as children. It’s NO different. The key is to have a CLEARLY defined policy. It’s essential that these 4 things be addressed when building, re-building, or even breaking apart your ensemble cast. You need to know that the people you have hired or are hiring make up just the sort of team you need to ensure your company’s growth, prosperity, & longevity. A Criminal, A Whore, An Idiot, & A Liar: Why the controversy over Scandal only touches the surface. WOW! This is my 1st post in over a year’s time. The last year had it share of ups & downs but would I trade the experiences & the wisdom gained through those experiences, absolutely NOT! As many of you who follow me on twitter @HumanistExec (FYI twitter has SUSPENDED my account with NO RHYME REASON OR PROVOCATION & I am appealing this vehemently-you can still MENTION me & I can still see it, but unfortunately I cannot respond) know that I am a great fan of a show on ABC starring some of my favourite actors & actresses including Kerry Washington, Tony Goldwyn (Actor/Producer/Director), Jeff Perry, & Joshua Malina aptly titled SCANDAL. NOW I’m not going to go into plot particulars etc because that’s NOT what this post is about & if you’re interested in the show, I suggest you NETFLIX the 1st season, & then use ABC.com or HULU to catch up on the 2nd season. It’s well worth the time & is an exceptionally written show. No THIS post is about a controversy that erupted yesterday over the comments made by one Star Jones. The screencap below shows the comments DIRECTLY as the appear on twitter’s website. Here’s the thing & other Gladiators (Scandal Fans) can attest to this, the criticisms of this show & it characters can generally be separated into two distinct categories; either a person dislikes the show PERIOD or they dislike the characters & the character development & how they interact with the other characters on the show & the impact they have on the overall show as a whole. YES, it’s a SHOW. It’s a work of FICTION. Here’s the thing about that: I feel like we have had to put up with so-called ‘reality-based’ TV shows for so long that when FINALLY we get SCRIPTED, WELL-WRITTEN show that we can attach ourselves to the characters we will battle to the death for it so to speak. And THIS IS OK. Just like it’s OK to watch a show or film & not necessarily agree with the direction the characters take on-screen OR how they develop. 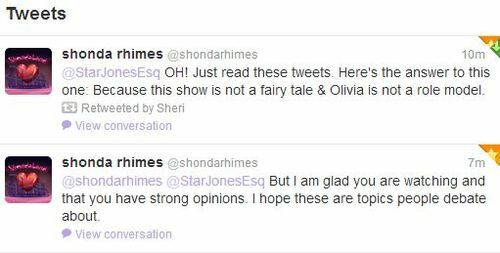 And THEN there’s the comment Ms. Jones made regarding Kerry Washington’s character Olivia where she basically calls her A WHORE. 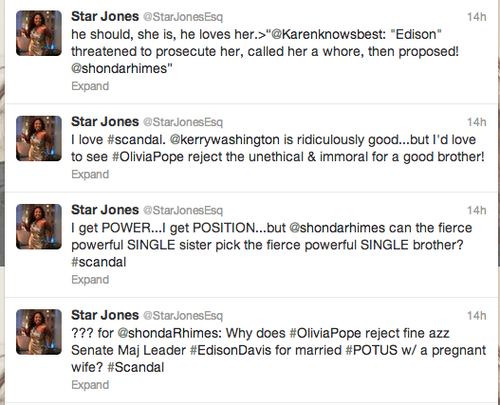 (In this same vein Ms. Jones expresses that she has spoken to Kerry regarding the show only JUST last week so there’s that) Again, REMEMBER the name of the show is SCANDAL. That implies the characters, their paths, & their actions have FLAWS. So after this incident I began to search twitter & facebook for more comments similar to the ones made by Ms. Jones & was NOT AT ALL surprised to find that the majority of them AGAIN come from other BLACK MEN & WOMEN. 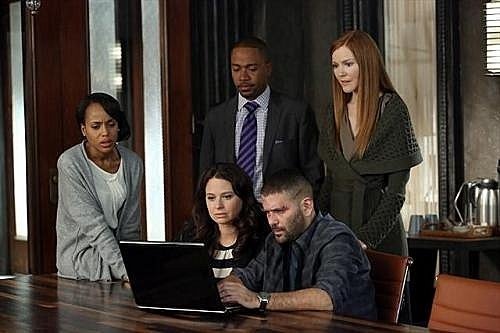 Scandal had 6 MILLION HOUSEHOLDS last week that viewed a RE-BROADCAST of the show. It’s viewers are multi-ethnic, multi-racial, span generations, AND socio-economic lifestyles. And yet 90% of the hatred & disgust comes from a small representative sample of the viewing public. WHY? Many of you know a bit about my background & are aware that I grew up OUTSIDE the United States thanks to my Father’s career choices as well as the choices made by my Mother, an educator, who wanted me to have the best well-rounded education possible. I bring this up because outside of the US interracial relationships/marriages/children etc are so much more commonplace & NOT UP FOR DISCUSSION as they are here in the US. The venom, the anger, the bitterness that is being spewed (trust me, Ms. Jones’ comments are MILD compared to some of the other unfit to print things I have seen in the past 24 hours) at Ms. Washington’s character & to an extent Mr. Goldwyn’s characters is so telling & yet so compelling. So many in the US are still SO indoctrinated by the remnants of Jim Crowe, segregation, & to a lesser extent slavery that even in the year 2013 we are STILL having this discussion & people are still ‘STONING’ those who chose to love whom they chose to love. 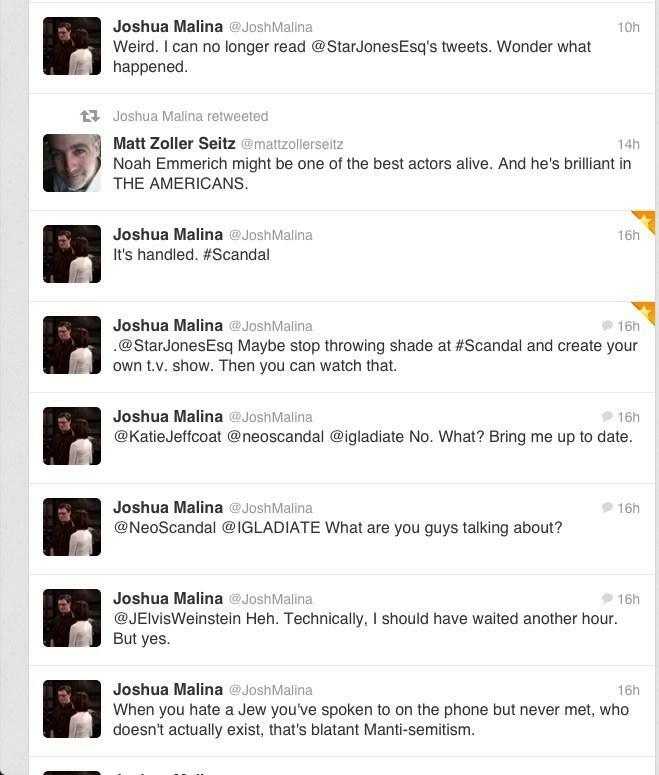 Again, this is a SHOW, & it’s called SCANDAL. To be frank, the ONLY thing on the show that should NOT still be a SCANDAL in 2013 is the race/ethnic background of it’s characters. It’s 2013 ladies & gentlemen. The world is ROUND, the sky is BLUE (eh, most days), OUR PRESIDENT IS BLACK, & if one colour of the rainbow chooses to align itself with another well then, that’s just fine too. If you’re using Amazon Cloud Drive/Player STOP STOP STOP right now & read this MAJOR ISSUE!!! OK so as most of you know I have been using Amazon’s cloud player/drive service rather excitedly for the past 24-48 hours. Unfortunately I have found a MAJOR FLAW that I MUST bring to fellow early adopters attention because it could cause you to PERMANENTLY LOSE YOUR MUSIC FILES, IF YOU DON’T RETAIN THEM ON A HARD DRIVE until the system is FAILSAFE!!! Here’s the issue: There are TWO screen in the amazon cloud matrix that most of us are going to use on a consistent basis the Cloud PLAYER interface & the Cloud DRIVE interface. And if you like me you’re using the Amazon MP3 uploader to load your music library to the cloud drive/player. HOWEVER I have found that even though the mp3 uploader may tell you ALL the music you asked it to upload is now on the cloud, SOME OF IT MAY IN FACT NOT BE!! 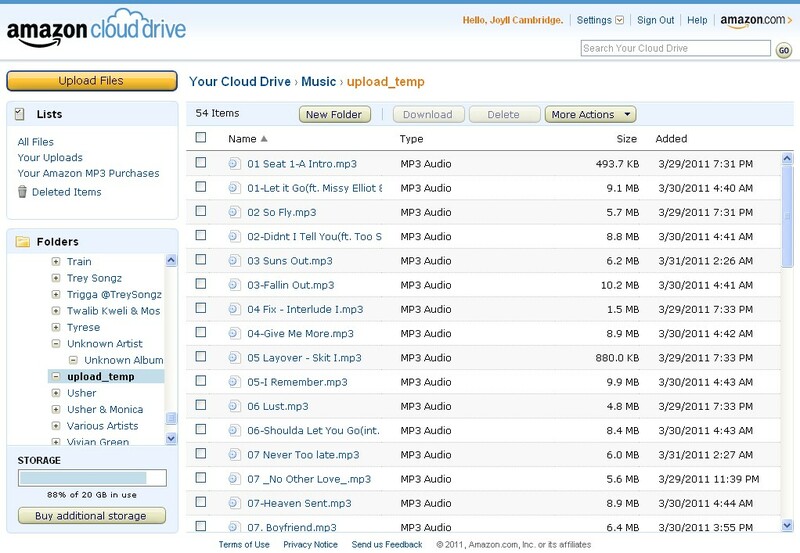 Here’s what’s happening: If you look on the Cloud DRIVE screen on the lower left hand side (have to have folder list expanded) you will see your music folders, in THAT list there is a folder labeled upload_temp. What I have found (this has happened multiple times already) is that SOME FILES EVEN A WHOLE ALBUM WILL GET PERMANENTLY STUCK IN THIS FOLDER!!!! I tried moving them to the correct album folder under the correct artist & the song NEVER shows up! I tried PLAYING the sound using the cloud PLAYER, SONG never plays & Cloud PLAYER never acknowledges that the song exist! This is a HUGE problem & needs to be fixed RIGHT AWAY before ANY user decides to delete their library from their hardrives or SD Cards or WHATEVER!!! I IMPLORE Amazon to get this issue fixed right away, for some of us our music collections are DECADES old & it would be a shame to lose our music trying to utilize a product that has GREAT potential!!! This is Joyll Cambridge, The Humanist Exec. Have a FANTASTICALLY WONDERFUL DAY! Well well well. People have been asking me all day who exactly is the Humanist Exec & why would we possibly want to hear anything she has to say? Here goes….. I’ve been an executive for nearly 15 years. I’ve managed & coached all sorts of people from many different countries & all different age groups & socioeconomic backgrounds. I get asked on a frequent basis how do I handle all that. It’s simple, I remind myself daily in every single interaction with the people I work with that they are all HUMAN first. Something I believe all too often many of us have forgotten. The aim of me creating The Humanist Exec is not just to share my knowledge in the leadership arena, but more importantly to actively engage with the rest of the members of what I call humankind. We’re going to talk about news, economics, politics, family, love, healthcare, ANYTHING. THESE are the things that are important & matter in our daily lives, in a time when we deal with so much, that DOESN’T.